1080 Poison Warning. 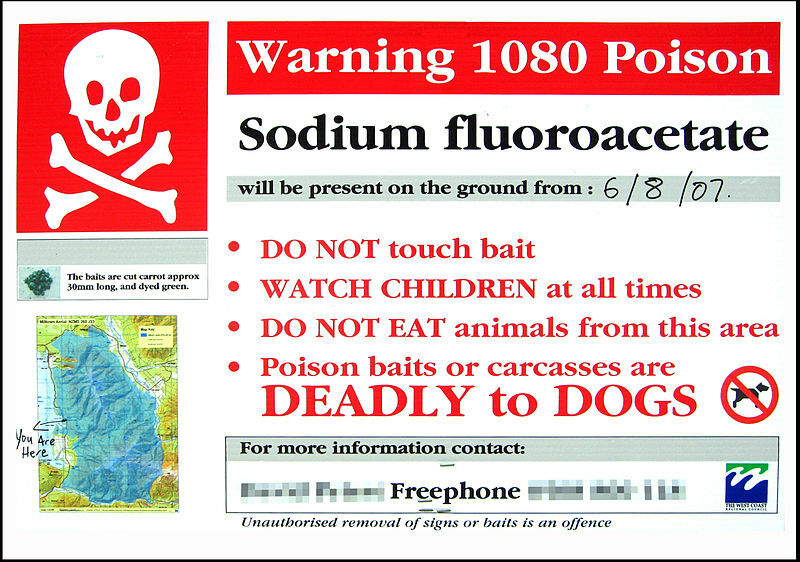 Sign warning of the presence of 1080 poison (sodium fluoroacetate) near Lake Kaniere on the West Coast of New Zealand. Credit: Greg Obrine. Via Wikipedia . Click here for licensing terms. Sodium fluoroacetate is used as a rodenticide. Farmers and graziers use the poison to protect pastures and crops from various herbivorous mammals. 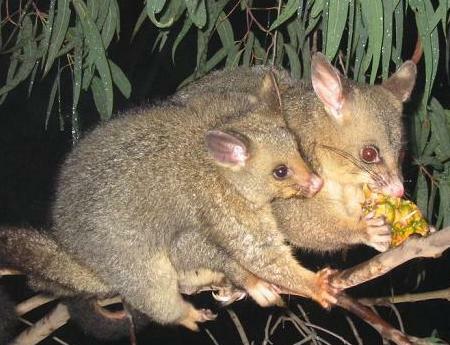 It is used in New Zealand to control the Common Brushtail Possum. Other countries using 1080 in large quantities include Australia, Mexico and Israel. Compound 1080 is the most toxic pesticide registered by the World Health Organization, WHO. It is rarely used in the U.S. because it is highly toxic and kills wildlife indiscriminately. The only manufacturer of 1080 left in the U.S., Tull Chemical Co. in Oxford, Ala., ships most of its production to New Zealand. Human data: The probable oral lethal dose has been reported to be 50 mg [Deichmann and Gerarde 1969]. Note. An oral dose of 50 mg is equivalent to a person being exposed to about 30 mg/m3 for 30 minutes, assuming a breathing rate of 50 liters per minute and 100% absorption. European settlers aiming to establish a fur industry introduced the Common Brushtail to New Zealand, where they are now regarded as undesirable. The worst ecological damage to NZ environment, however, is caused by human activities such as agriculture, forestry, mining and tourism. Fluoroacetate disrupts the citric acid cycle (also known as the Krebs cycle) by combining with coenzyme A to form fluoroacetyl CoA, this is then substituted for acetyl CoA in the citric acid cycle and reacts with citrate synthase to produce fluorocitrate. A metabolite of fluorocitrate binds very tightly to aconitase, thereby halting the citric acid cycle. This results in an accumulation of citrate in the blood which deprives cells of energy. In humans the symptoms of poisoning normally appear between 30 minutes and three hours after exposure. Initial symptoms typically include nausea, vomiting and abdominal pain; sweating, confusion and agitation follow. In significant poisoning cardiac abnormalities including tachycardia or bradycardia, hypotension and ECG changes develop. Neurological effects include muscle twitching and seizures; Consciousness becomes progressively impaired after a few hours leading to coma. Death is generally due to Ventricular arrhythmias, progressive hypotension unresponsive to treatment, and secondary lung infections. Because of the biochemical interference in the TCA or Krebs Cycle, sodium fluoroacetate poisoning is very difficult to treat, as once clinical symptoms are shown, the Krebs Cycle has shut down. There is no known effective antidote. This has nothing to do with 1080. It concerns a dermatological medication called Aldara, which a New Zealand dermatologist recently prescribed for me – without saying anything about its potentially devastating side effects. She said it would clear up the few remaining minor (almost unnoticeable) lesions on my face. A week after I started to apply it to these small areas, I came down with flu-like symptoms and moderate to severe pain throughout my body. I had a shooting pain up the back of my head, pain across my shoulders and down into my right forearm, and pain in the pelvic area and down both legs. I couldn’t sleep without a heavy dose of painkillers, and then, the next day, I couldn’t sit at my desk without acute discomfort. After five days of pain, which was not responsive to heat treatment, I realized I didn’t have flu, and was suffering some sort of side effect. It was then that I did a Google search for “Aldara+side effects”, which revealed the horrifying facts about this medication. I read that it works by modifying the immune system, and also attacks mucous membranes throughout the body. I was appalled. In fact, I was so shocked, I couldn’t read all the patients’ testimonies. How could the dermatologist have prescribed such a dangerous medication for such a minor problem? Of course, I stopped applying it immediately. And after about five more days, the pain stopped. But I was left with a question that I don’t think anyone can answer: Have I done irreparable harm to my health? After all, you don’t have to have spent a single day in medical school to know that a modification of your immune system can cause a multitude of illnesses, and possibly even death. (Some users of Aldara ARE reported to have died.) A few days later, my fears were reinforced when I suffered a hemorrhage in my right eye – another side effect of this frightful medication that is reported by some patients. How long will this unsightly problem take to clear up? One month? Two months? And then what? Far out – pray that Demontologist,I mean Dermatologist, suffers the effects of his prescription 7 fold, he will soon stop. Thanks for sharing this [painful] information with other readers. Will see where else on the blog could link to the comment. Is Aldara manufactured in this country? A great doco on this is Poisoning Paradise by the Graf bros. Lots of interesting info. Poisoned waterways, livestock dying, govt cover up, etc. On the flip side the bird life is springing back. So… I don’t know. The sign published here is a ‘new’ version, the old ones warned against drinking the water or taking it out of the area. If you can point to one of the older photos posted anywhere, we’ll add it to the page. NZ needs local volunteers who will put their time where their mouth is and take a couple days a month to preserve the environment by trapping pests, cleaning up, monitoring, counting, and in general assist with the massive physical conservation work instead of just paying lip service to “fun” like entering poster contests. The poison is used because the manpower and funding do not exist. If Kiwis cared enough to GIVE of their time and effort collectively and throw their weight behind these projects, this poison would not be needed. Please, whether you are Maori, Pakeha or migrant, donate your time and effort for everyone’s sake and for the sake of the very special creatures that are struggling to survive as species. A New York Times article says New Zealand’s clean, green tourism branding is as “fantastical as dragons and wizards” as it clashes with the reality that the country’s environment is in a bad state. In the build-up to the release of The Hobbit film later this month Tourism New Zealand released Hobbit-themed advertisements promoting “100% Pure Middle Earth, 100% Pure New Zealand” showing picturesque scenes of the country’s native bush and rivers. But, according to a recently-published New York Times article, the images portrayed “might not be exactly warranted”. “There are almost two worlds in New Zealand,” Mike Joy, a senior lecturer in environmental science at Massey University in Palmerston North, told the newspaper. Last month the Ministry for the Environment released a survey showing more than half the country’s freshwater recreational sites were unsafe to swim in, largely due to the contamination of waterways by the dairy industry. The New York Times article says the government was “desperate” to have The Hobbit filmed in New Zealand after the success of the Lord of the Rings trilogy which pumped $400 million into the economy, through tourism, in 2004 alone. Pure Advantage, a nonprofit group promoting green business, estimates that the country will overtake the United States in per capita emissions in less than eight years, putting it almost into the world’s top 10. A recent report by the same organisation said the nation’s environmental record was worrying for its economic future and New Zealand needed to give legitimacy to its “100% Pure” brand. Tourism New Zealand spokesman Gregg Anderson says the campaign isn’t misleading international tourists as “100% Pure” was never just about the environment, it was also about the experience. What kind of sick joke is this? Last time I was in Te Anau, the restaurant food was so vile I ended up eating buns from a bakery. More recently, in Auckland, some Japanese relatives made the mistake of ordering “Peking duck” in a hotel restaurant. I knew it would be inedible, and it was. It was impossible to cut, even when considerable pressure was applied to the knife. I wouldn’t have given it to my dog. BTW, dozens of animals, including horses, were killed during the filming of ‘The Hobbit’ due to ‘poor accommodation and mistreatment [while] away from the set’ according to foreign news media. ‘Bluffs, sinkholes and broken-down fencing’ were cited among the worst ‘deathtraps’ for the animals, many of which died of horrific injuries. No doubt the film producers will vehemently deny the claim.